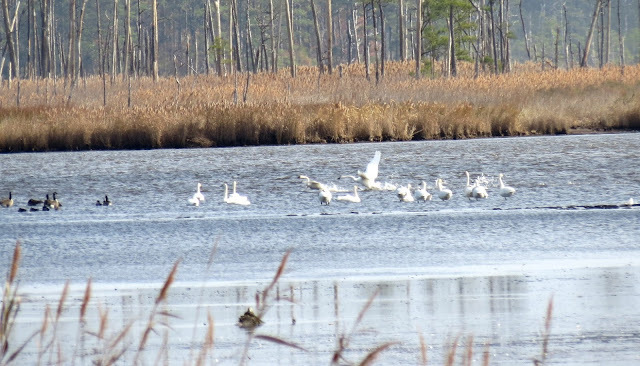 I am sharing some of the birds from the Blackwater Nat'l Wildlife Refuge in Cambridge Maryland. We stopped here for a quick visit on the way home from the beach.. It breaks up the drive home, we took a walk on the Marsh Edge Trail and drove on the wildlife drive. It is nice to see the White Pelicans enjoying Blackwater NWR. I think there was a count of 40-50 White Pelicans. Their numbers increase each time I visit. 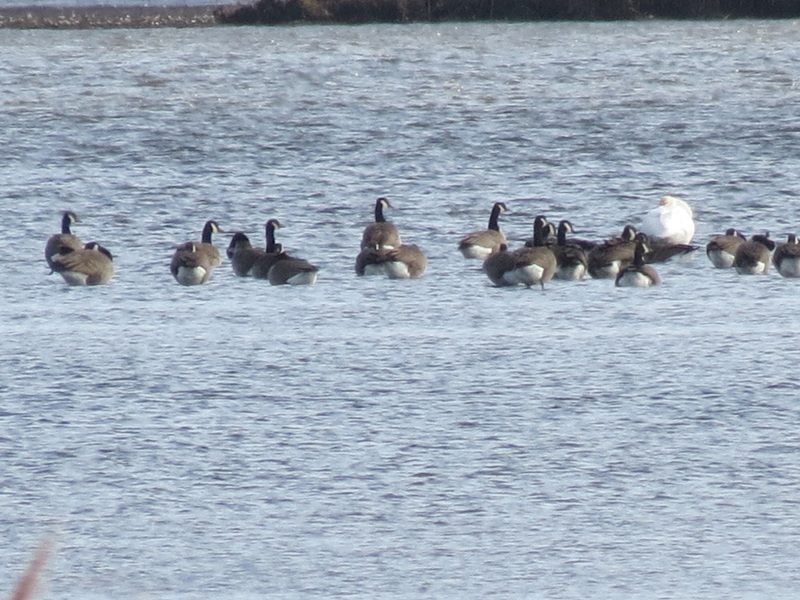 There was a good number of Tundra Swans also seen from the wildlife drive. We also saw the Canada Geese, we were a little early to see the Snow Geese. 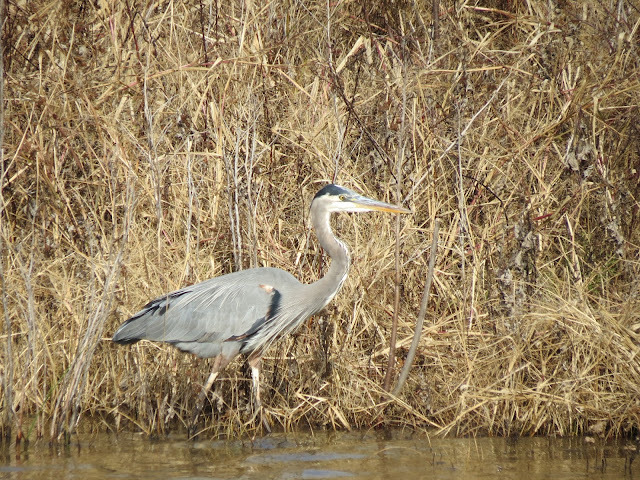 A number of Great Blue Herons were seen from the drive. 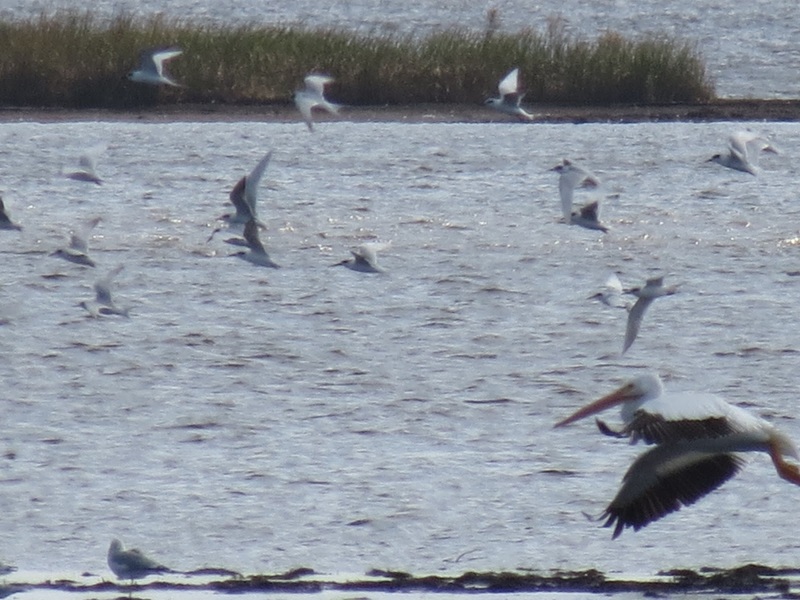 Not the best shot of the White Pelican in flight with some Terns, maybe Forster's Terns? I hope you enjoyed coming along with me to Blackwater NWR. As always thanks for the visits and the nice comments. I also thank everyone who is linking up and sharing their critters.. Happy Saturday, have a great weekend! I just love the pelicans Eileen, for a large bird their flying is so graceful, cant say the same when they walk though. Hope you are having a great weekend. The shot of the swans is my favorite. I love the pelicans and the heron. Thank you for hosting, Eileen. Hello Eileen! More fantastic photos! I really love the Great Blue heron and pelicans are always fun to watch! Great post and thanks for hosting! 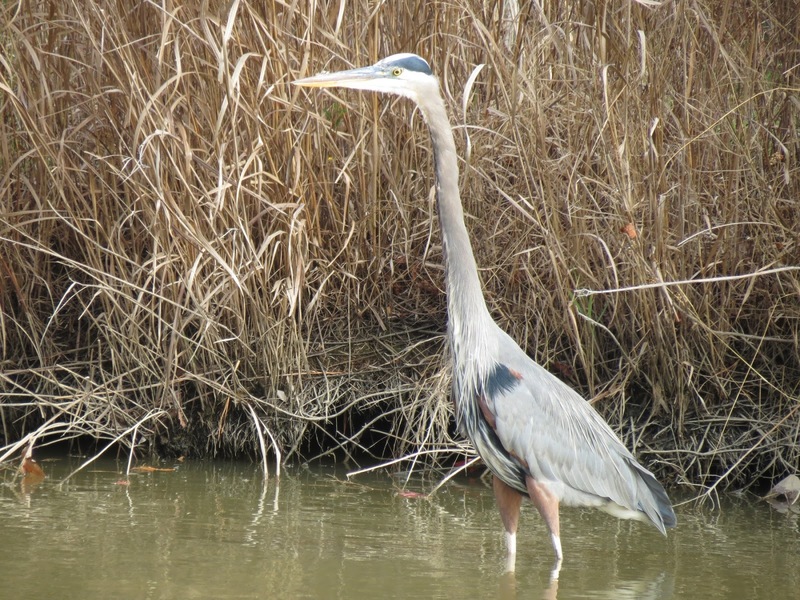 The Great Blue Heron is a wonderful sight. Such a nice mix of birds. Though we share many of the same species, we don't get them in the big numbers like you do. Well, except for Canada geese.....we get a LOT of those! I especially like your pelicans. December is the month when we have had American White Pelicans on our local lake, but the water is so high now that the fish are widely dispersed into the marshes and wet prairies. We do not even see herons on the lake, and there are no mud flats for sandpipers. Florida weather is topsy-turvey as we should be well into the dry season. Well, the good thing is that there will be plenty of fish to concentrate in the lakes and canals when the dry weather finally arrives, if ever. We have El Niño to thank! Very nice variety. Especially like the pelicans of the first one. Happy Day. I loved all your shots, Eileen! Enjoy your weekend! All the best! Another lovely set of photos, Eileen. Many thanks for hosting. Hello Eileen and thanks for the invite today. I wish we had a drive by where I could see and photograph all those species. Love the close-ups of the heron and I'm sure those waders are Greater Yellowlegs but don't hold me to it. Lovely critters especially the White Pelicans and Blue Herons. Thank you, Eileen for hosting. Have a wonderful weekend! I love the White Pelicans, they are superb. Have a beautiful weekend Eileen. Nice mix of birds photos! I especially like the last one. What pretty photos, Eileen. Thank you for hosting....I have a photo I can share today! Eileen, I love to see water birds so I really enjoyed this post. I don't travel a lot so I've only been to a few birding parks that have a lot of water. I did get to visit Bentsen-Rio Grande Valley State Park in Texas several years ago, and it was the highlight of my trip. Very nice variety of birds! Great photos of the heron! Yes, we totally enjoyed the visit to Blackwater. I love the variety of birds you seem to see year-round! only ones i've seen (land) here are gbhs and greater yellowlegs. great variety! what a nice variety of birds! white pelicans are a spectacular sight! and the blue herons. thanks so much for sharing, eileen. awww, the white pelicans excited me. Here in Tampa we mostly see only brown pelicans. It's so heartwarming to see a bird sanctuary where these beautiful creatures can exist without stress, and multiply so future generations can enjoy them! Thanks for bringing them to us. I have learned so much about different species - before I was aware of your blog I thought there was only one type of egret, tern, etc.! We occasionally see white pelicans up in my neck of the woods. It's always a thrill. Swans are even better! soooooo very cool to see the pelicans!!! and those herons, always a treat, you got some beautiful images!!!! hope u r well. Happy Critters Day! We have a wonderful flock of Pelicans that live along the banks of our Whitesand River. I'll have to try and get out there this Spring or Summer and get some really good shots of them. I hope you're enjoying your Saturday! I see there are plenty of links to visit today...off I go! i like the pelicans, they are cool. Love those heron shots! I rarely see pelicans, for that matter. Once again Eileen, Thanks for adding your link to this post at I'd Rather B Birdin' this weekend. You have some wonderful wildlife refuges there...stunning captures! So many pretty birds! 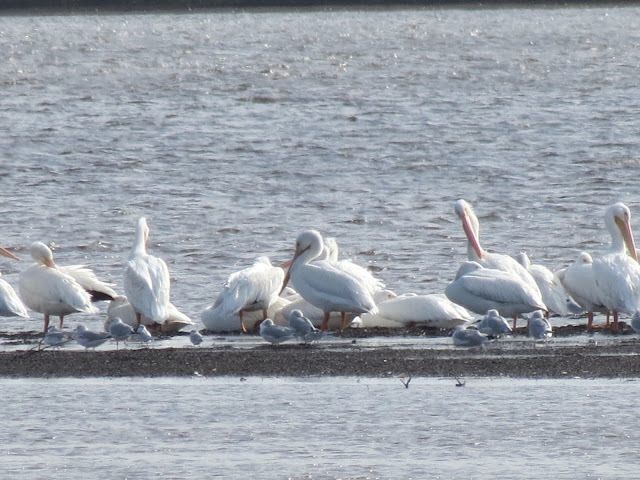 I love seeing the white pelicans. Love the white Pelicans..Herons too..I guess I like all forms of water birds..Hope you are having a fun weekend..
Love your photos of the pelicans and the heron pics are great too. Hi Eileen, So nice to see the large number of White Pelicans there. 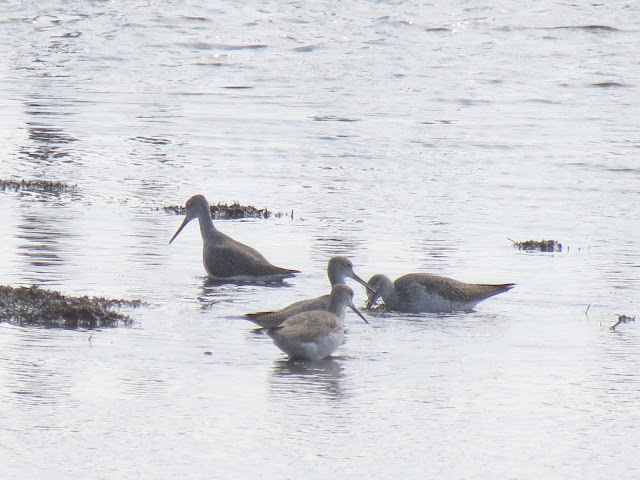 I am thinking that the birds are Greater Yellowlegs as the Lesser Yellowlegs I have seen were somewhat smaller but that may be regional? Who knows? Have a wonderful coming week and a pleasant Sunday. Eileen, as always, great photos, and what an amazing variety and number of birds to see and enjoy! I wish it was closer to us, I'd love to go just to have a chance to see the snow geese. I've not seen them since we lived in Alaska. I love those herons and pelicans! Love the Great Blue Heron with his white waders on! 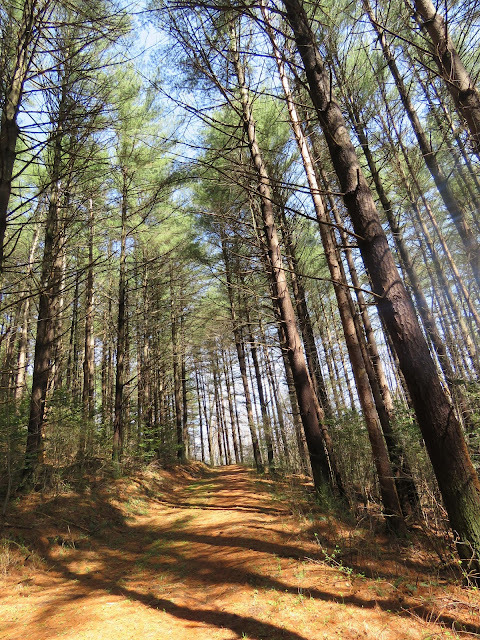 Thank you SO much for your sharing these photographs and hosting. Nice pictures. Great to see so many pelicans to eachother. Nice pictures of that heron. Those White Pelicans are spectacular birds. Great job! Great photos !! I love birdwatching !! Great shore bird action shots and other serene shots ~ Always wonderful photography! Great images Eileen, thank you for sharing. What wonderful White Pelicans, Eileen! And I'm jealous (in a nice way!) of the fact that you may see Snow Geese! Thank you for your kind comments on my tree post. really wonderful to see all these citters around the world. I like your white pelicans. You have great birding everywhere you go! It is nice to break up a long drive with some birding and hiking ... Our preferred way to travel ...but we didn't get to do that on our latest roadtrip.